The unmanaged Ethernet switches from the Ha-VIS eCon series now offer you further new models with RJ45 and fiber optic cable ports to enable the efficient setup and expansion of your Ethernet networks. Networks in modern production facilities are becoming increasingly complex. The unmanaged Ethernet switches from the Ha-VIS eCon series now offer you further new models with RJ45 and fiber optic cable ports to enable the efficient setup and expansion of your Ethernet networks. The Ha-VIS eCon 2000 and 3000 families allow you to react optimally to every spatial and application situation. The unmanaged Ethernet switches from the Ha-VIS eCon 2000 family offer up to 16 Fast Ethernet ports and are also available in a 7-port Full Gigabit version. This allows customers to expand or setup network infrastructures in a time-saving, economical way. Owing to the extremely flat design, the switches can also be accommodated in installations where space is restricted towards the cable connection at the front. RJ45 and FOC ports are located on the front of the switches, allowing cables to be connected quickly and simply. In combination with the flat design, this is genuinely unique. Unmanaged Ethernet switches from the Ha-VIS eCon 3000 family feature up to 10 Fast Ethernet ports an offer economical and fast options to expand or set up network infrastructures. 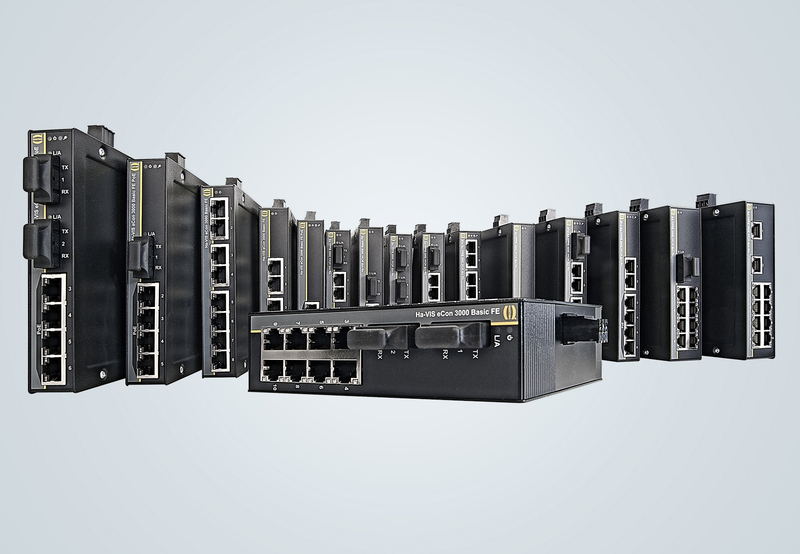 Full Gigabit Switches are available with up to 7 ports for applications with high data throughput. The slim design of the switches also allows them to be positioned on the carrier rail with a very high packing density. Thanks to the DIN rail that is integrated in the housing, the switches' can be swiftly and simply installed in the field, which consequently helps save money and time. Additional protection for your Ethernet Switches, RFID- and Network Components. Based on our complete HARTING connectivity portfolio, we design customized cable assemblies to match your requirements and transform standardized housings into tailor-made solutions for your company. Devices and applications are getting smaller and more compact. So the circuit boards and innards of the devices must move closer together. HARTING is responding to the trend towards miniaturization with appropriate solutions for the various dimensions and applications that involve PCB connections. All of our Experts are available during normal business hours 8am - 5pm CST. To better serve you, please VideoCall the Expert for your region based upon the map above. Governor Rauner, HARTING and Elgin Mayor Kaptain announced that HARTING will expand it's manufacturing facilities creating 50 new jobs within 24 months. Please contact the HARTING Customer Service for any questions concerning pricing and product availability or lead times. The HARTING Technology Group offers a broad modular system for the implementation of innovative and future-proof Ethernet cabling. This preLink® modular system arose from the requirements of the most disparate users and existing standards, as well as HARTING's experience. What it does, and how it’s done. The means by which humans interface with machines. Hard metric connectors in 2 mm contact pitch based on IEC 61076-4-101 with press-in technology. Specifically developed for the next generation of telecom, medical and industrial applications. 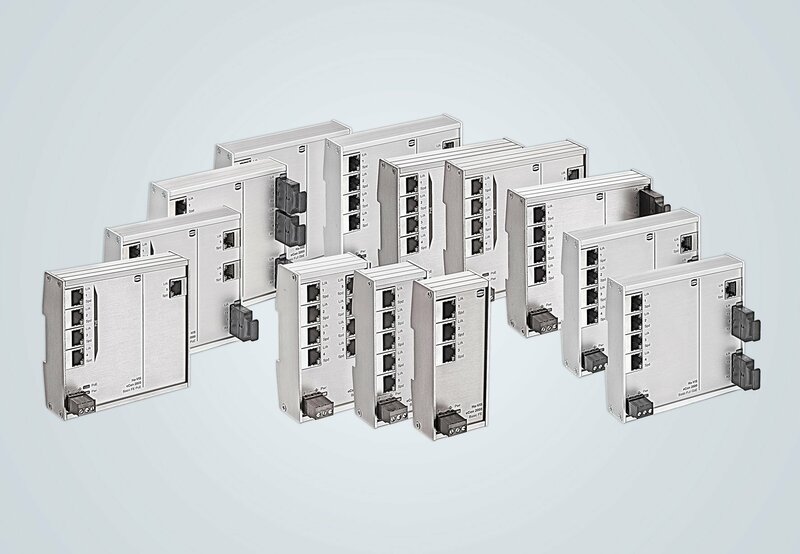 The HARTING Ha-VIS preLink® is an entirely new device connectivity that fulfills all of these requirements, while simultaneously combining the demands of profile-specific cabling for the automation market according to ISO/IEC 61918, with the advantages of generic cabling in accordance with ISO/IEC 24702 and EN50173-3. The HARTING's modular and compact interface connector system har-link® in 2.0mm pitch allows data transfer rates up to 2 Gbit/s. An EMI shielding concept guarantees excellent function in EM-polluted environment. World's first M8 D-code connector for 100 Mbit/s Fast Ethernet from the cloud to any sensor. Vibration-free. No screws. Plug in with a "click". HARTING PushPull connectors provide compact outdoor rated solutions for a safe shock-and-vibration-resistant connection. HARTING's mobile applications allow you to configurator solutions, determine your cost savings, and access hundreds of educational content pieces to keep you up-to-speed in the industry. Trains are a critical form of moving people and things from one point to another. Integrating IIoT functionalities has become essential for train companies and transit authorities who want to improve the safety, reliability, and maintenance of their systems. Compared to other applications, trains have special requirements. Trains travel at high speeds through harsh environments. The environments and vibration during travel means that all systems on the trains need to be extremely robust and reliable. HARTING's small, robust edge-computing gateway device/Industrial PC for the IIoT and Industry 4.0. This series meets all the electrical requirements for implementing of high-quality connectivity solutions in hazardous locations in the Americas. Digitalizing a factory. Improving Overall Operational Efficiencies (OEE) using technology. Building a predictive maintenance system. All of these are reasons that companies are turning to Industry 4.0. However, implementing a solution specific to an existing factory can seem overwhelming. As no two applications are exactly the same, finding an out of the box solution that perfectly fits in your existing application is unlikely. Having said this, tailoring existing, tested IIoT solutions for your applications is easy with the right partner. This is the concept behind HARTING’s IIoT Solution Packages. Condition monitoring is a necessity in modern production and business models. Condition monitoring (or, colloquially, CM) is the process of monitoring a parameter of condition in machinery (vibration, temperature, et cetera) to identify a significant change that is indicative of a developing fault. It is a major component of predictive maintenance. Companies cannot afford any unexpected downtime caused by machine malfunction and power. Taking precautions to monitor the health and viability of equipment is a must. Condition monitoring allows to operate old machines and infrastructure (e.g. conveyor systems) longer than originally planned. This way, investments can be minimized and shifted to strategically important topics. Asset Tracking is the method of automatically tracking physical objects using various forms of technology. As there are many different types of objects that can be tracked, and specific requirements for each object, several technologies exist to accomplish all the different asset tracking solutions. From scanning groceries at a check out, to monitoring shipping containers as they cross oceans, below is a brief overview of the different technologies involved to make these types of applications happen. Understanding the location of assets as well as stored and updated information about the asset is the core of automated asset management. One of the most reliable and widely used ways to manage assets is via an MICA RF-R500 RFID system. RFID is a technology that uses radio waves to read, capture and store information on an RFID tag that is attached to an object. Injection molding machines are the center of the manufacturing process for many companies and, due to the materials and processes used, one of the most complex machines on the floor. This is why the first machines a company considers for upgrading with IIoT capabilities is usually the injection molding machines. The Industry's First IIoT Starter Kits It’s easy to talk about integrating IIoT (Industrial Internet of Things), but it’s another thing entirely to do it. Many people don’t know where to start or what IIoT applications would benefit their operations the best. That’s why HARTING developed these IIoT starter kits. Each kit has everything needed for a basic application and is ideal for those starting with IIoT. The HARTING MICA boasts a container-based open architecture so users can easily customize to their specific application well beyond what is included in the kits. When the decision is made to integrate IIoT, there are two possible strategies. Either a company can invest in completely new machines and equipment that were developed exclusively for this need or they can upgrade their current machines, otherwise known as legacy machinery, and equipment with devices that make this type of communication possible. Digital retrofit here means taking a device that produces or uses data of some sort and connecting it to a device that can allow that data to be a part of a larger data pool. The Industrial Internet of Things (IIoT) connects machines, analytics, and people to create powerful insights to drive smarter, faster, and better business decisions. The IIoT is made up of interconnected machines and devices that can monitor, collect, exchange, and analyze data. It is transforming the industry and changing the way the industry functions. By combining machine-to-machine communications with analytics, companies can reap the benefits of unparalleled efficiency, productivity, and performance. VideoCall an Expert NOW! All of our Experts are available during normal business hours 8am - 5pm CST. To better serve you, please VideoCall the Expert for your region based upon the map above. Han-Eco® is a modular connector that carries almost no weight. It forms an ideal solution, when it comes to the optimization of an interface’s weight and price. Design, development and manufacturing of customized solutions based on HARTING technologies. You can find all US distributors and distributors of HARTING products here.